With its roomy crossover cabin and rugged capabilities, the all-new 2019 Chevrolet Blazer is a welcome sight for fun-loving families on the run. If the name sounds familiar to you, that's because this isn't the first time that Chevy has had a Blazer in its SUV lineup. Previous iterations include a two-door SUV with a removable top. But this new SUV nestles into the current Chevy SUV lineup between the small Equinox and the much larger, three-row Traverse. 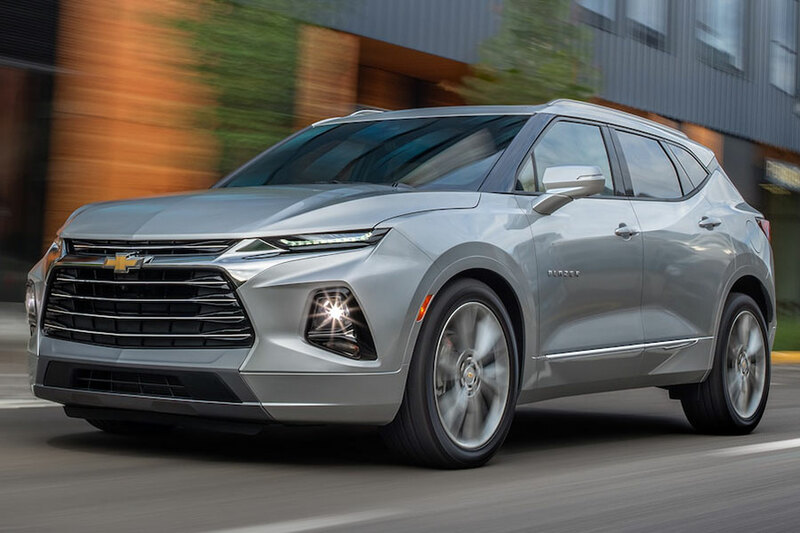 Which 2019 Chevrolet Blazer trim should I choose? There are four trim Blazer levels: the L, LT, RS, and Premier. Once you balance the features you want with your monthly budget, it's easy to choose the right model. Here's a look at some of the highlights. Keep in mind that as you move up the Blazer hierarchy, each model's longer list of features comes with a slightly higher price tag. The L trim is the most cost-efficient Blazer. But it doesn't short you at all, especially when it comes to tech features. 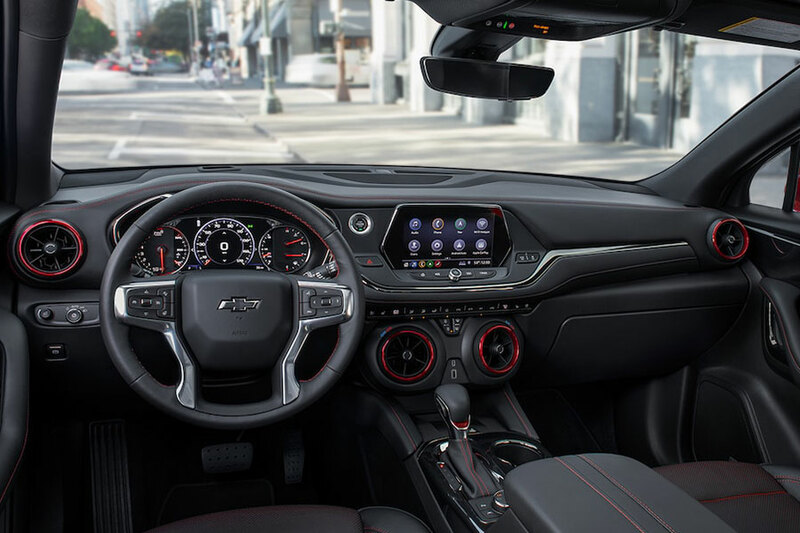 Connect your smartphone to the infotainment system using Apple CarPlay and Android Auto and you've got easy hands-free calling, texting, and navigation features. Should something go wrong, OnStar has you covered with roadside assistance and automatic collision notification. OnStar's Wi-Fi hotspot is kid-friendly; bring your tablets along and they can stream Netflix to their little hearts' contents. There are actually three LT subtrims - the 1LT, 2LT, and 3LT. The 1LT has little to add to the base equipment - though the spare tire is a notable addition. The 2LT gives you the V6 engine upgrade. If you've got heavy toys to tow, this is a good trim to start with. The 3LT offers increasing luxury - think leather upholstery, heated front seats. This trim also gets an A plus for timesavers, the list of which includes remote start and a power liftgate. Choose this Blazer if you want something a little extra. Inside, the heated steering wheel and navigation system are finishing touches on the 3LT's luxurious cabin. Outside, the RS has its own sporty style with a blacked-out front grille and 20-inch wheels. This is the fully loaded version of the Blazer. Besides all of the aforementioned features, it also includes heated and ventilated front seats and an eight-speaker Bose sound system. Is there a 2019 Chevrolet Blazer diesel? Unfortunately, diesel power is not yet an option for the all-new Blazer. What is available, though, are two potent gas-powered engine options. The standard engine is a 2.5-liter four-cylinder engine rated for 193 horsepower. This is the smaller engine, so it'll give you a little extra fuel mileage. Then there's the optional 3.6-liter V6, which boosts power to 305 horses, making it the better option for off-road adventure and towing big toys. How about the Chevy Blazer's Performance? Properly equipped, the all-new Chevy Blazer can tow up to 4,500 pounds. That's enough heft for even a horse trailer or a small camper. Whatever your pleasure, the Blazer definitely makes for a more entertaining weekend. The smaller base engine earns the most mileage, with EPA ratings of 22 city/27 highway mpg. With the more powerful engine, the EPA estimates that the Blazer will earn 20 city/26 highway mpg. These numbers aren't bad when you consider the Blazer's rugged power and towing utility - not bad at all.